Thank you to Kikkan for sending this postcard to Geography Cat. The picture is of Øresund Bridge, which links Sweden to Denmark across the Øresund Strait. This remarkable link is actually made from three sections; firstly, the cable-stayed bridge which is approximately 8km long. Secondly, the artificial island of Peberhom which was constructed half way across the strait, and finally a 4km long immersed tunnel. In its most practical sense any bridge is a method of overcoming a physical obstacle, in this case a body of water, in other examples rough terrain, or a settlement below. However, it becomes more than the sum of its structural parts as a bridge connects people, it allows people to cross those tangible obstacles and trade with each other. The bridge results in cultural, financial and political connections. This is especially the case at Øresundsbron where two separate nations are joined. 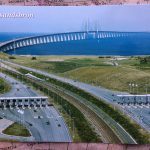 This bridge is also The Bridge of the Scandinavian crime series written by Hans Rosenfeldt and produced jointly by Sveriges Television and the Danish Broadcasting Corporation. If you’ve seen the programme you’ll know that co-operation between the police departments of Sweden’s Malmo and the Danish capital Copenhagen is at the crux of the storylines; this resonates with the dual nation co-operation required to create the series, and the massive undertaking by both countries to plan, finance and construct the Øresund Bridge.